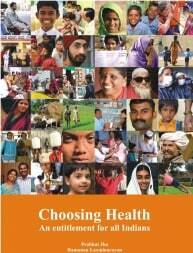 How should the Indian health system reform to attain levels of health similar to those in other progressive democracies? Indias states need to Increase government spending, though due to poor management and governance pouring large sums of money into the health system is not the answer. Resources should be allocated to achieve greatest health gains most efficiently, in a measurable way. A mere 1.2% of GDP is needed to buy services to form a universally accessible Entitlement Package (by 2017) that could save millions of lives. Impact evaluations should be conducted and national frameworks to regulate health care providers should be set up. If outcomes point to success, the package should be extended through additional investment. After a decade of rapid economic growth, more than 250 million Indians are still living below the poverty line. Poor health imposes a large burden on society and improving the publics health is one of the best ways to tackle poverty. Since the mid 1990s there has been a reverse in health gains, for which an underfunded, poorly managed, and poorly governed health system is largely to blame.